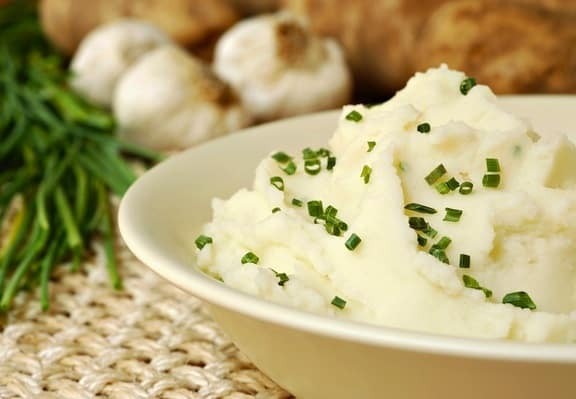 Mashed potatoes laced with smoky-flavored roasted garlic adds a big yum factor to a comforting classic. No worries if you’re a bit shy of garlic — roasting garlic makes it much mellower and sweeter. 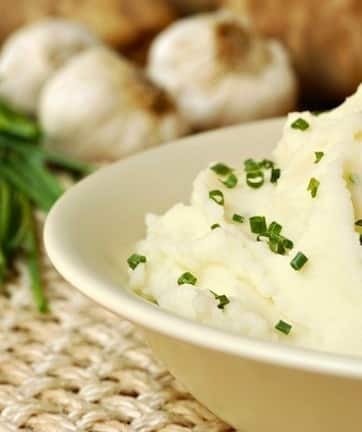 Mashed potatoes laced with smoky-flavored roasted garlic adds a big yum factor to a comforting classic. Remove some of the papery outer layers from the garlic but keep the cloves intact. Place on a baking sheet and bake in a 350-degree F. oven or 375-degree F. toaster oven for 40 to 45 minutes, or until the cloves are soft. When cool enough to handle, gently separate the cloves from the head of garlic and squeeze the soft pulp out of each clove into a small bowl and discard the outer skin. In the meantime, cover the diced potatoes with plenty of water in a large saucepan and bring to a simmer. Simmer steadily but gently, covered, until the potato dice are very tender, about 20 to 25 minutes, then drain. In a large, shallow bowl, combine the cooked potato dice with the Earth Balance or olive oil and stir until melted. Add ¼ cup of rice milk and the reserved garlic pulp and mash the potatoes until smooth and fluffy. If needed, add up to an additional ¼ cup of rice milk to loosen the consistency. Season with salt and pepper, then transfer to a serving container. Sprinkle some scallion or chives over the top and serve at once, or keep warm until needed. Variation: Substitute a large sweet potatoes for two of the white potatoes.